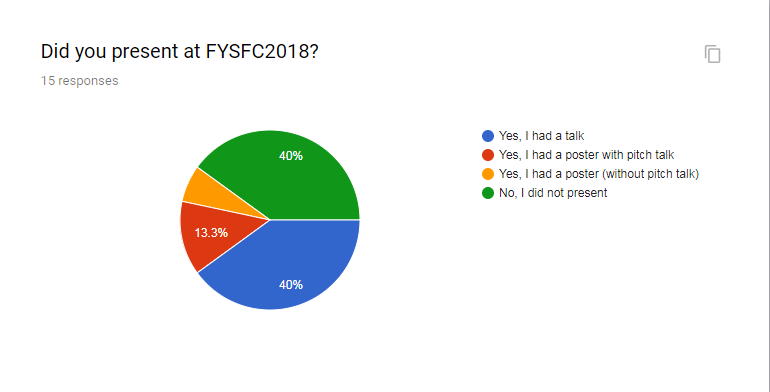 The feedback questionnaire related to FYSFC2018 event by the Finnish Catalysis Society, shared in Katse 1/2018 (link) with the goal to develop the event further for next year, received fifteen responses. Warmest thanks for everyone who responded! Summary of the feedback is shown below and to be shared in Katse 2/2018. The event was very well organized. Speeches stayed on schedule. Erittäin hyvin järjestetty tapahtuma. Erityisesti plerary oli ajatuksia herättävä. Erittäin hyvä, että opiskelijoille tarjotaan mahdollisuutta harjoitella suullisten esitysten pitämistä. Ruoka oli hyvää ja sopivasti ajoitettu. The plenary lecture was of a high-quality. It was nice to connect and network. Plenary talk was excellent. Event was planned and organized very well. Especially impressed by how well the schedule was adhered to. It went smoothly. I did learn new and useful things. Aikataulu oli tiukka, joten oli hyvä, että sovituista ajoista pidettiin kiinni. Foorumi pidettiin todella kauniissa ympäristössä! Poster session was organized for the first time in 2018. Numeric feedback on it was overall positive, taking into account this was the first time a poster session was organized. As development ideas, more time would be needed overall to have a look at the posters. Also, it was suggested that for each poster, an oral pitch would be included. As usual, people call for time to mingle around during coffee brake(s). This entry was posted in Uncategorized and tagged katalyysiseura. Bookmark the permalink.